Kalamata Airport and Stoupa are just two of the many locations to pick up your car hire. Our rental cars can also be delivered to Kalamata bus station, Athens airport, plus various other locations by arrangement. 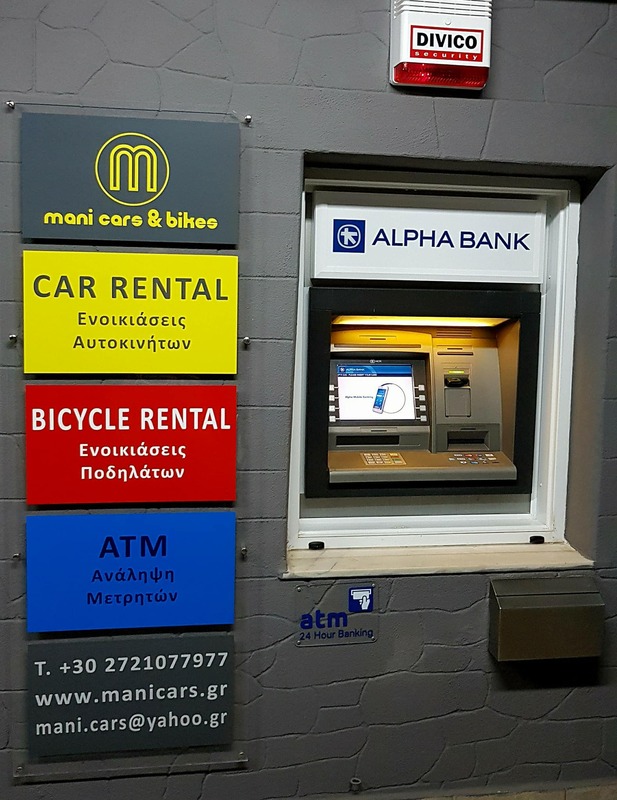 Based on the sea front in Stoupa, Mani Cars is a local company - owned and run by local people with over 20 years of experience in the Car Rental Industry & General Tourism. We provide car rental at very competitive rates in comparison with the much larger companies. To help you arrange pick-up and drop-off times at Kalamata Airport, we now have a table of scheduled flight arrivals and departures for 2019. You can access this from the page menu in the "Kalamata Airport" drop-down, or click here to go directly to the page. Here at Mani Cars we pride ourselves on our personal service & customer aftercare to all our clients. When you hire a car from us you can feel totally secure as we guarantee the price we quote - will be the price you pay! We provide the best value in car and bicycle hire with very competitive prices. Why not Contact us today for a personal tailor made quote to suit your specific needs. If you're planning a trip around the Peloponnese, hiring a car is a great way to see as much of the area as possible. Renting a car gives you the freedom to plan your own trip and see the sights at your own pace. There are NO hidden extras or charges when you book a car with us & we guarantee that your personal information remains secure at all times. You may find cheaper prices elsewhere but our personal service is unbeatable!!! Mani Cars and Bicycles does not charge for cancellations. We have the Kalamata flight schedules for 2019. You can find them in the page menu under "Kalamata Airport". © 2011-2019 Mani Cars, ALL Rights Reserved.